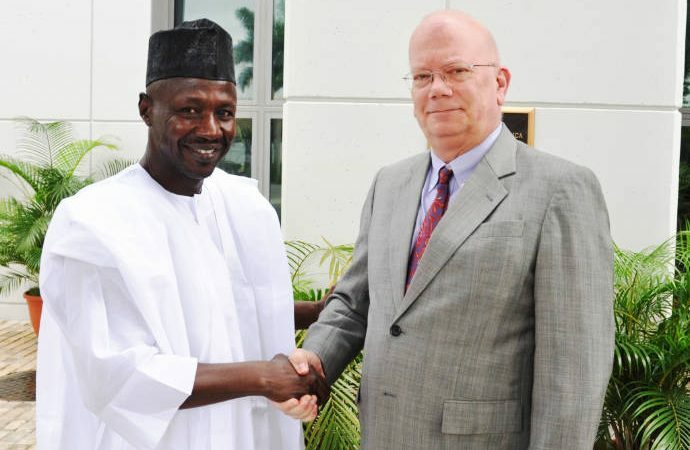 The outgoing Ambassador of the United States of America to Nigeria, James Entwistle, has commended the Acting Chairman of the Economic and Financial Crimes Commission (EFCC), Ibrahim Magu, for his astute war against corruption in Nigeria. The EFCC Chairman said he visited the Ambassador purposely because he want to bid him farewell as he round up his tenure in Nigeria. Magu, however, thanked the envoy for his support and cooperation. He also urged Entwistle to continue to monitor his performance as chairman of the EFCC, assuring that having come this far, he would never compromise his integrity in the fight against corruption.